DK-ACP (Access Control Phone) is functional at Gx series telephone system and IP gateway that has DK port interface. It is an all-in-one device that contains Door phone, Wall mount phone, Talk-back Paging speaker and RFID card detector. 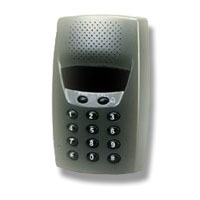 It is quite useful for warehouse or any place where people could be paged and answer back without touching. It also could be situated at controlled gate where people could access the gate by his RFID card, password or both. The entry access history will be automatically recorded and can be traced by separated software application â€“ The Access Manager. PRG Button: To activate some special features. Dial Keypad (1 to 0, *, #): Work as the normal phone keypad. Sensor: Feedback the Door open status to the system. Microphone: Used for Handsfree answer back. Four 7-segment blue LED: Show the Clock, dialing digits, system status, etc.